Browse SNMP data with instant editing support. 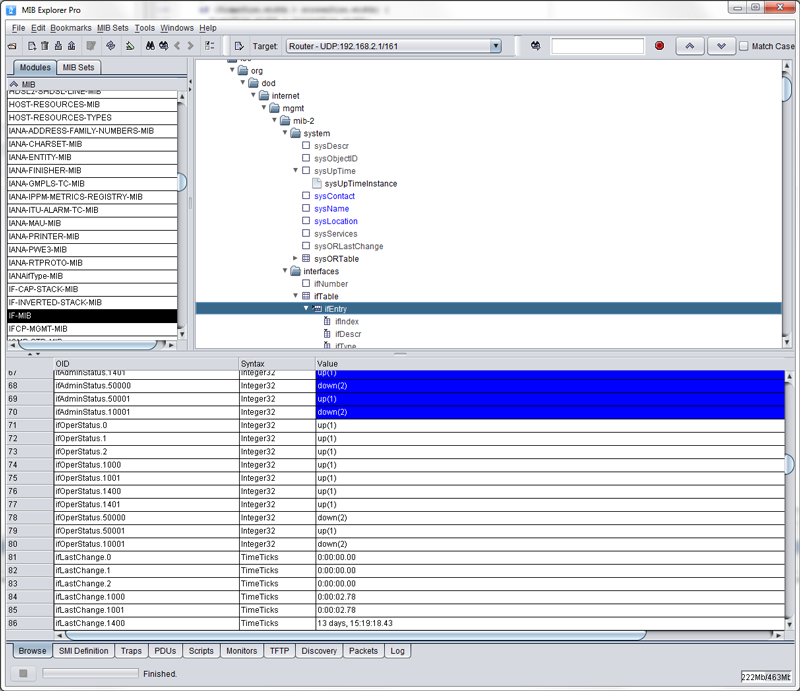 View, edit, and create SNMP values. Monitor SNMP devices with customizable charts and tables. 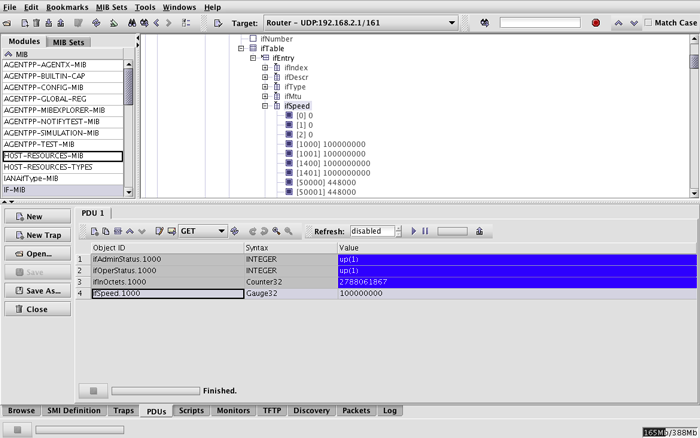 Debug and analyze SNMP agents. Create and edit MIB specification. Export SNMP data and create agent snapshots. Manage SNMPv3 security configurations for several devices at once. Advanced table view with multi-target support and delta highlighting. SNMP message analyzer online and offline even of encrypted SNMPv3 messages (i.e., by parsing log messages containgin hexdumps of messages). Automation of SNMP management tasks (script engine). Various MIB output formats: PDF, XML, XSD, Text, HTML. MD5, SHA-1, and SHA-2 (SHA-224, SHA-256, SHA-384, SHA-512). DES, 3DES, AES (AES-128, AES-192*, AES-256*) *If used Java Runtime supports strong encryption. Table contents can be refreshed periodically and exported to a CSV, XML, or XLS file. Row creation is easy using the advanced index editor. Augmented and expanded tables are detected and you can edit/view all or an arbitrary subset of those tables in a single table view. Receive SNMPv1/2c/v3 traps, inform requests, and notifications from SNMP agents. Apply your own trap severity indication color scheme based on flexible trap object identifier (OID) filtering. Persistently save and restore trap histories as XML file. Eight supported 2D chart types: Plot, Scattered Plot, Area, Stacking Area, Bar, Stacking Bar, Pie, and High-Low. Three 3D chart types: Scattered Plot, Surface, and Bar. Freely configurable data consolidation in round robin archives. Export of primary and consolidated round robin databases in tabular CSV and XLS files, as well as the export of chart images as JPEG, GIF, PDF, PCL, PS and PNG files. Configurable start date and time as well as fixed-rate or fixed-delay update periods. Legend with references to collected or computed data. Alarm generation with optional e-mail forwarding and execution of scripts to send SNMP messages. Index calculatation based on other MIB object values or another MIB object’s index. Optional data collection from notifications. Capture and analyze SNMPv1/v2c/v3 packets sent and received by MIB Explorer. Save and load captured packets to/from XML. Parse log files for dumped SNMP messages in hex format and list them in the packet analyzer. 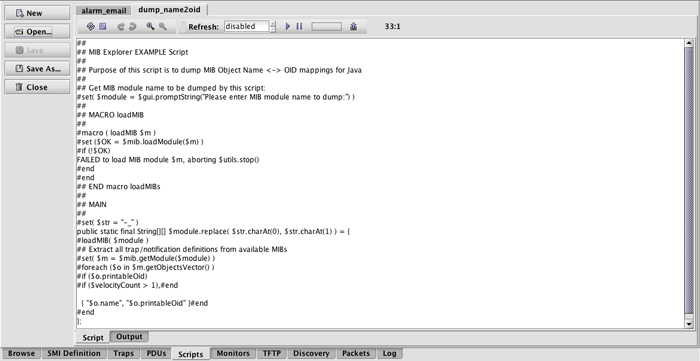 Compose any type of SNMP PDU by simply drag & drop nodes from the MIB tree into the editor. Save PDUs to disk (binary or XML format) and sent them to one or more targets at once. Sending a trap with the PDU editor is as simple as pressing the New Trap button and drag a trap or notification type definition node onto the PDU editor area. Then edit some or all of the values required for the trap and send it to a manager application to test its functionality. Execute any sequence of system commands or send an SMTP Email when an alarm is raised or cleared. Automate rather complex administration task, for example creating hundreds of connections in a switch. Create test scenarios for SNMP agents. Create a trap gun to test scalability and robustness of proxy or manager applications. Extract MIB module information and write it to a text file in any output format (e.g., HTML or XML). This can also be used to generate code for any programming language, in particular object name to OID mappings as shown by this script. 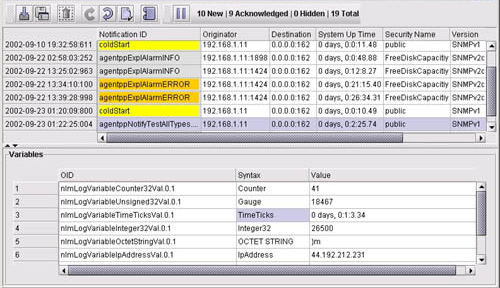 Trigger any sequence of SNMP operations (i.e., traps and informs) on alarm events generated by MIB Explorer’s monitor tool as shown by the alarm example. 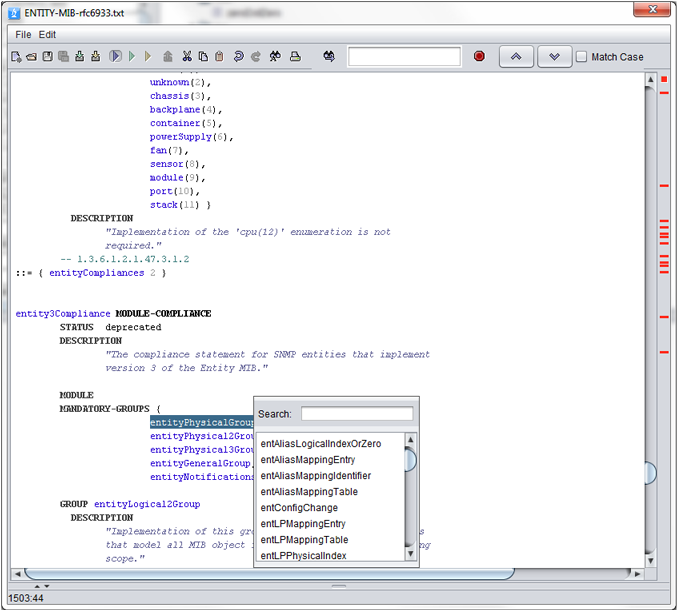 MIB Explorer’s MIB file editor supports syntax highlighting, auto-completion via Ctrl-Space, formatted printing, as well as search and replace by regular expressions. Its integrated MIB compiler ensures that MIB modules are in conformity with the latest SMIv1/v2 (and PIB) specifications. Syntax errors are highlighted in editor. The standard mode has all syntax and semantic checks enabled and thus ensures full standard conformity. The lenient mode disables most checks to be able to use low quality MIB specifications with MIB Explorer.